Pour 5 cups of water into a medium pan. Sprinkle gelatin powder over water and heat mixture over medium heat, stirring constantly, until gelatin powder is completely dissolved in water (about 5 minutes). Remove from heat and allow to cool 5 minutes. Add flat soda and stir. Pour 1 cup of mixture into each of 8 cupcake bags (or plastic cups). Set bags in small bowls so they stand upright in fridge; leave bags open as they chill and set in fridge, about 1-2 hours. When gelatin is almost set, use a sharp knife to cut a slit into top of gelatin in each bag. 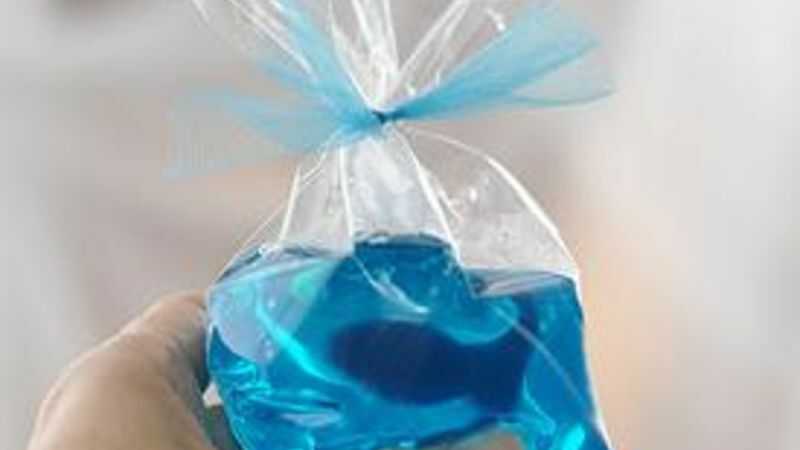 Use an uncooked spaghetti noodle or wooden skewer to slide gummy fish into position in the gelatin. Tie bags with ribbon and return bags to fridge to set completely. Keep refrigerated until serving.